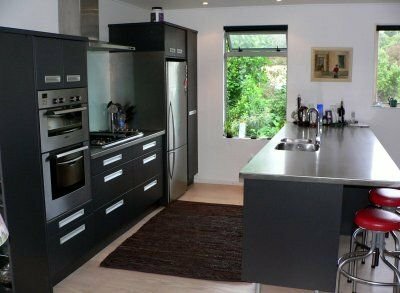 Potters Kitchens listen and respond to their customers and will produce plans and 3D drawings to suit your specific needs. With over 25 years of manufacturing and installation experience, our plans are practical and designed to get the best out of the work area available. Potters Kitchens offer a full range of materials and products. 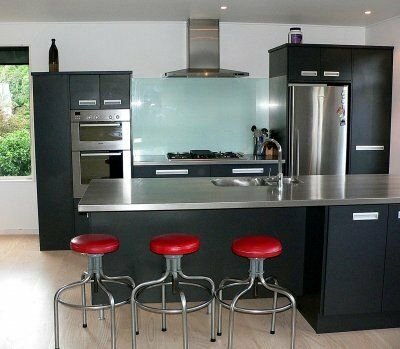 All our cabinetry is manufactured on site at our Lower Hutt workshop. We use quality MDF whiteboard rather than chip board because we believe this is more durable and gives a better finished look. We use solid 2mm pvc edging, 16mm backing on all our units and quality european hardware. Once the plans are signed off, kitchens are usually ready between 3 to 4 weeks. 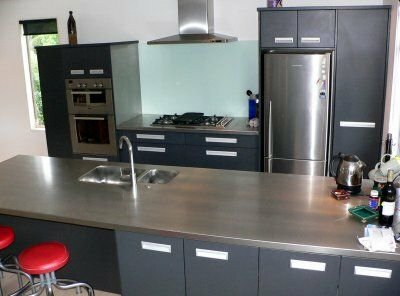 Some bench tops - for example stainless steel, granite or engineered stone - may take a little longer. Potters Kitchens use fully trained, experienced installers for all their installations. On average our kitchens take between 12 to 14 hours to install. Talk to Potters Kitchens about appliance packages. We offer a range of appliances including Westinghouse and Parmco at competitive prices.